In a nutshell, Study apps are the apps designed to make studying simpler and super cool to experience. In contrast to studying for hours in the library, which can be quite boring, study apps offer far more improved methodology which makes the whole exercise worthwhile and exciting as well. However, just like other Apps available, there are lots of Study Apps available which makes it quite difficult to decide on which to choose from, this article presents the top best five studying apps that have been tested and trusted beyond doubts. Photo-math is one of the best student study apps, it is a highly unique application that can help its users learn mathematics in an efficient manner. Simple to use, all that is required is a picture of any math problem and the application will show the user how to solve it. It has the similarity to a calculator as to solving problems but uses a step by step method to explain mathematical and statistical equations. Photo-math supports a variety of mathematics including arithmetic, fractions, decimals, linear equations, and some types of logarithms. And to think this app does all these without charge is quite awe-inspiring, isn’t it? Khan Academy is a popular Smartphone online resource for learning dated back since 2015. Since then, this platform has become a famous source of help for students, the app teaches more traditional subjects such as math, science, physics, and economics, along with many others. Khan Academy contains over 10,000 educational videos with various lessons that can either get users caught up in subjects or help refresh their memory in previously learned topics. Without a doubt, this App comes into the list of must-have resource for credible digital studying tools, quite one of the best educational app or best student study apps out there. Udemy is a learning platform that allows users to purchase and take courses on a wide range of subjects, Udemy’s courses focus more on skill-based learning such as classes on programming, learning to use Adobe or Microsoft software, and even cooking and speaking lessons. Using this app to study is also incredibly simple. All you need to browse for the list of interesting topics, buy the courses, and then receive instructional videos to begin learning the content of the class. With both paid and free courses, the app allows for free trials and lessons before committing to any purchase. The accessibility, range of courses, and simplicity makes Udemy a great app for studying. 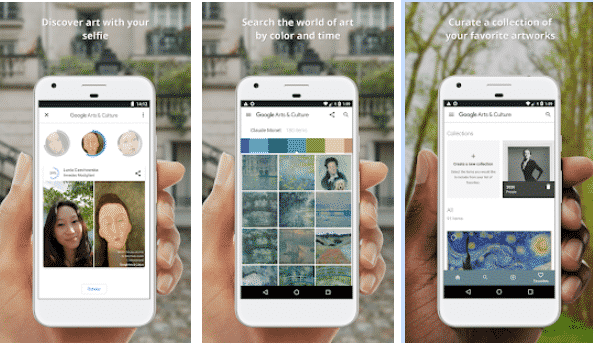 Arts and Culture is another Google app that contains a lot of information regarding arts and culture as the title suggests. For those who are studying various kinds of arts or cultures around the world. This app is one of the best student study apps you should have. The app features 360-degree description tours of hundreds of museums with various other landmarks and sites of historical significance. It also gives detailed information about artwork, artists, culturally significant collections, and stories to help users become more educated in the heritage of the human race. It is free to download and use, the app serves as a significant source of information for those intending to learn more about various cultures. From the list of highlighted best student study apps, users can be sure to get more hands-on for themselves and to others on self-teaching or tutorial based courses and materials. Although there are some other studying tools available, the highlighted options capture the range of benefits that make it perfect for studying anytime, anywhere.